Robolab awarded by International Telecommunication Union (ITU) and MITSOT, Pune - Robolab Technologies Pvt. Ltd.
MIT School of Technology Management (MITSOT) had celebrated the World Telecom Day on 17th May 2018 at the MITSOT Pune. ITU celebrates this day to create awareness about the advancements happening in the field of internet and information and communication technology. The internet and information and communication technology users are targeted by ITU for this celebration. ITU’s theme for 2018 is “Enabling the positive use of Artificial Intelligence for all”. Focusing on this theme, MITSOT had organized a half-day Conference on “AI Technology for Peacebuilding” as a part of the World Telecom Day celebration. Dr. Milind Pande (Project Director- MITSOT), Dr. Sunil Rai (Vice-chancellor, MIT-ADT), Dr. Madhuri Joshi, (Chairman-IET), Ms. Moushami Dasgupta and Mr. Sunil Avhad, (Sr. Director, Capgemini) graced the occasion with their esteemed presence. Mr. Amit Khade, Mrs. Ridhima Dua, Mr. Murali (Founder-Aquatic Blue) and Mrs. Vrinda Walimbe (President – Rotary Club of Pune- Shivajinagar) were the other esteemed guests. On this occasion, Mr. Amol Gulhane (CEO & Founder) of “Robolab Technologies Pvt. 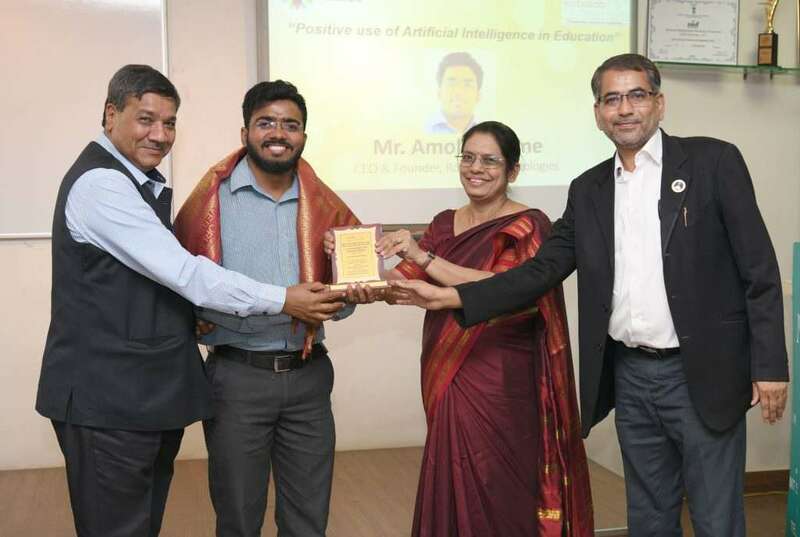 Ltd.” was awarded for their outstanding contribution in the field of “Positive use of Robotics and Artificial Intelligence in Education”.